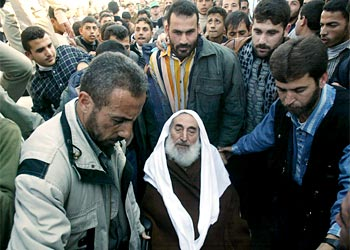 “The sheikh is dead, the sheikh is dead” people cried, shouted sadly. 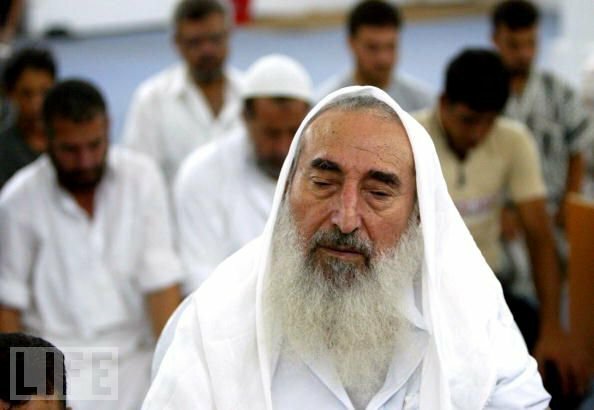 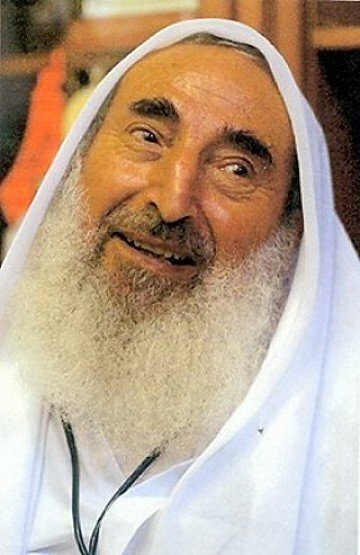 Sheikh Ahmed I. Yasin was born in 1938 in a neighborhood called Aljora in now occupied city of Magdal(the Zionist occupiers changed its name to Ashqelon). 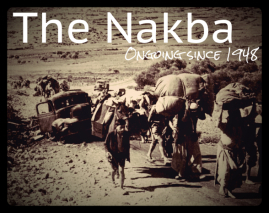 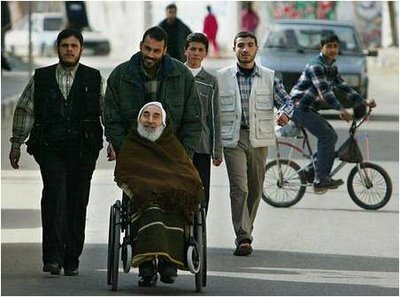 His family was forced to Gaza after the Zionist occupation to a great majority of Palestine in what is known as “Nakba”. 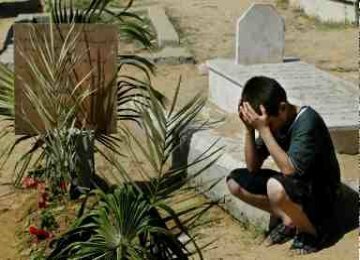 Three things affected his life to a great extent: first his being orphan since his father died when he was no more than three years. 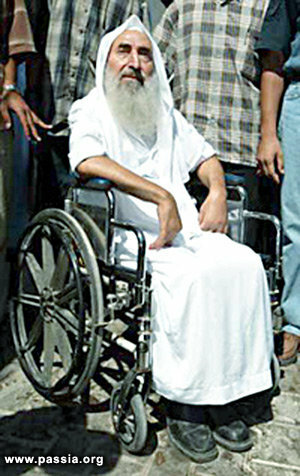 Secondly, being forced to leave his home town also left its traces in his heart and he had always a dream to go back. 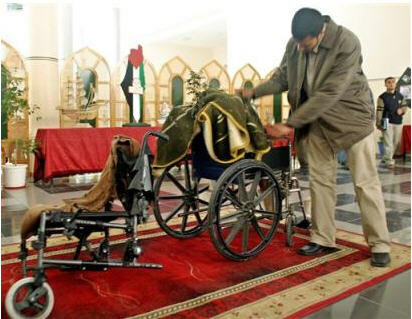 Thirdly, an accident in his childhood which left him paralyzed. 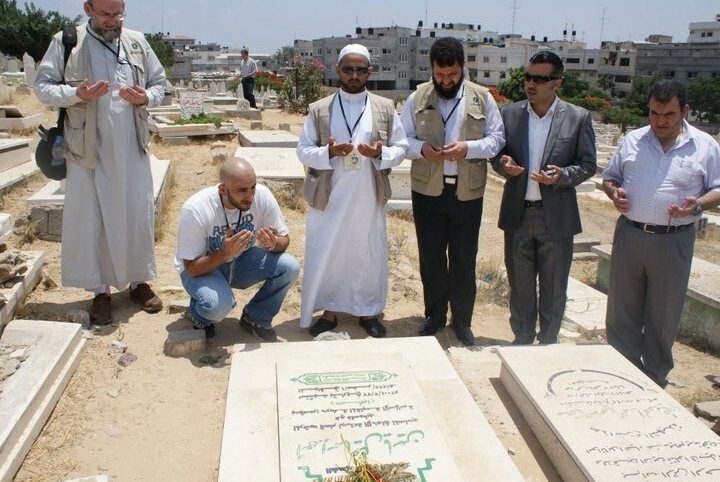 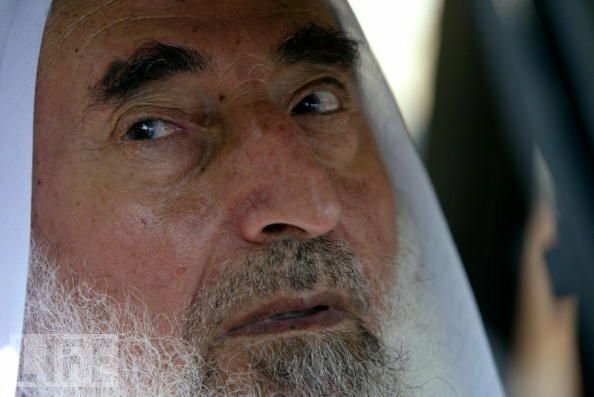 Sheikh Yasin strongly believed in his rights as a Palestinian—that all Palestinians must (one day or another sooner or later) return back and that all Palestinians who were forced to leave their land. 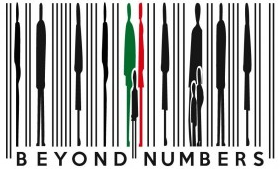 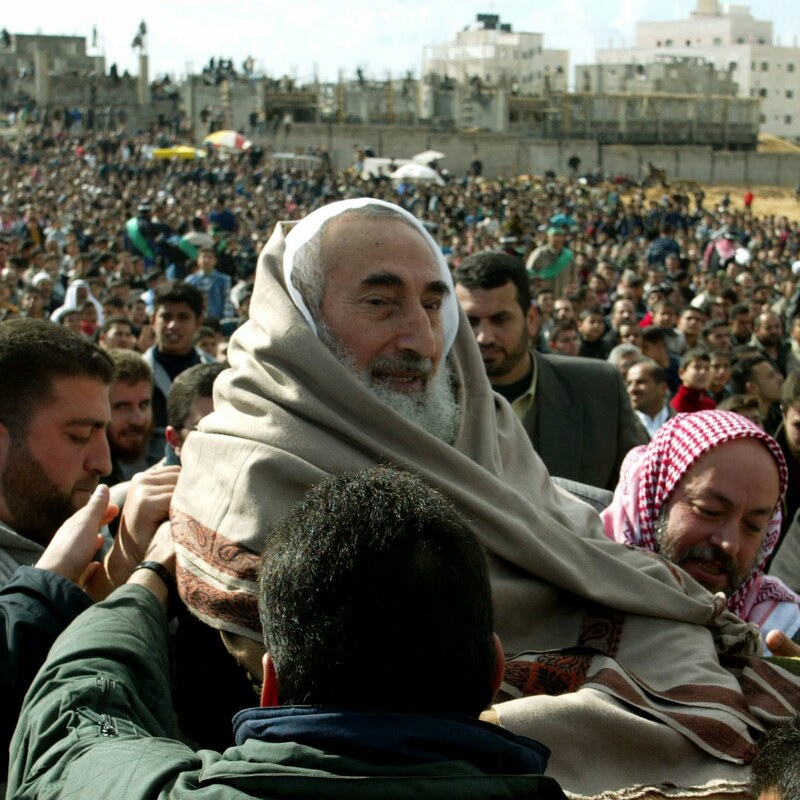 The Right of Return was as important to the Sheikh as our right to breathe. 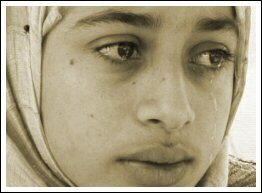 Refugees are a priority. 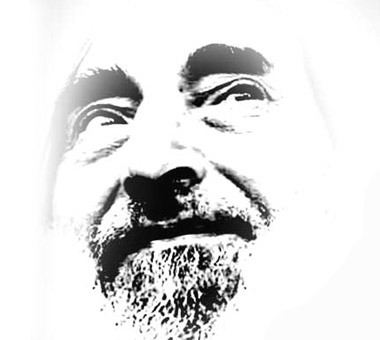 He always said. 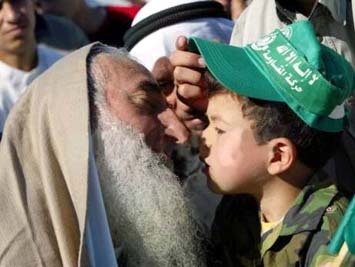 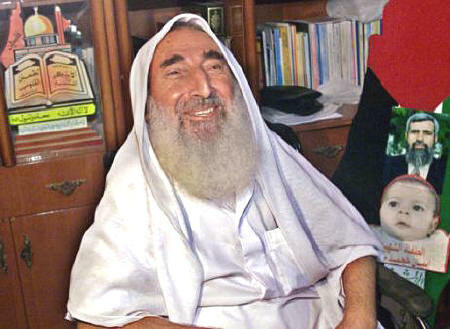 Sheikh Yasin Yassin grows up in Gaza refugee camps. 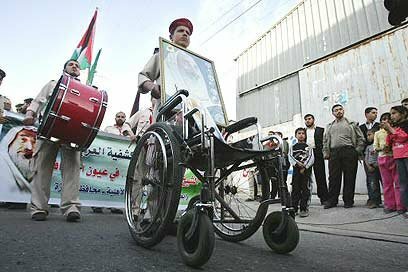 At age 12 is paralyzed in sporting accident. 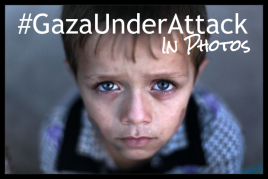 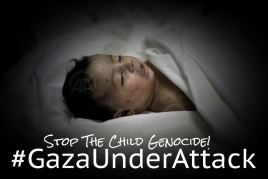 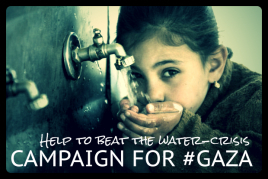 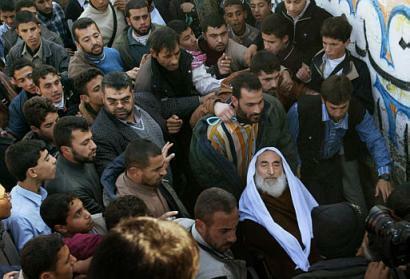 He later raises 11 children in three-room apartment in a suburb in Gaza City. 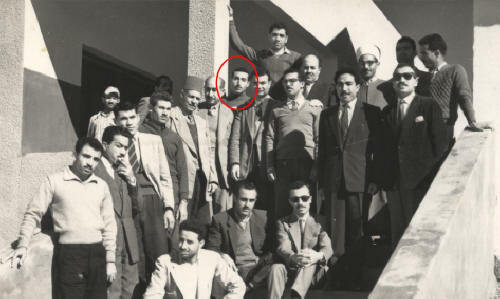 He finished his secondary school and planned to join a university in Egypt to study English Literature, but both financial and physical problem prevented him from completing his higher education. 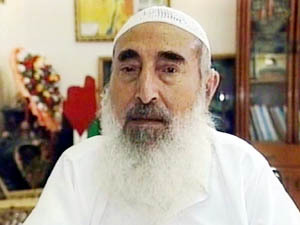 Sheikh Yasin was a teacher where he taught Arabic and Islamic teachings. 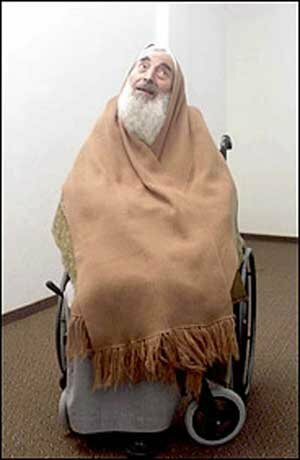 He was a devoted teacher who followed the steps of the first Teacher, Prophet Mohammed (Peace and blessings of Allah be upon him). 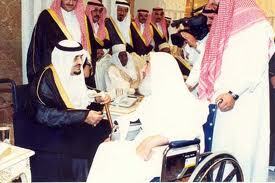 Due to his good manners and his readiness to help and to listen to others, people all of them respected him. 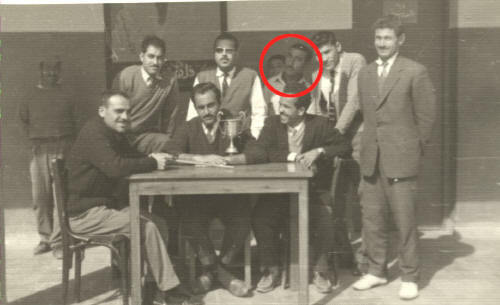 He used to give additional lessons to his students after school. 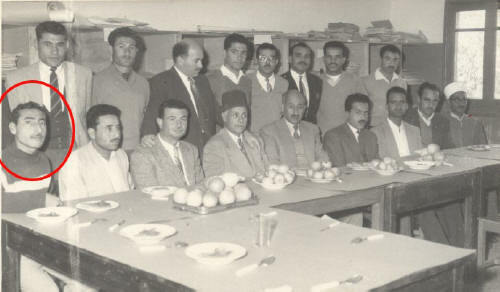 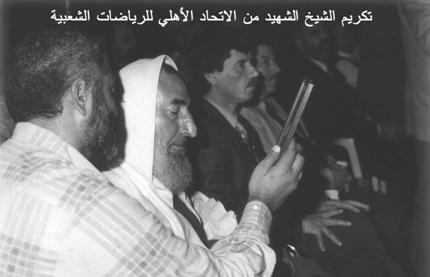 In the late 1950’s Sheikh Ahmed Yasin joined the Muslim Brotherhood, the famous Islamic movement founded in Egypt, and did his best to spread the teachings of Muslim Brotherhood. 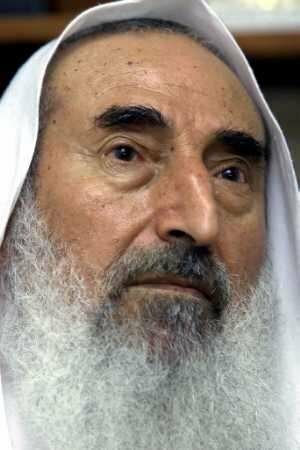 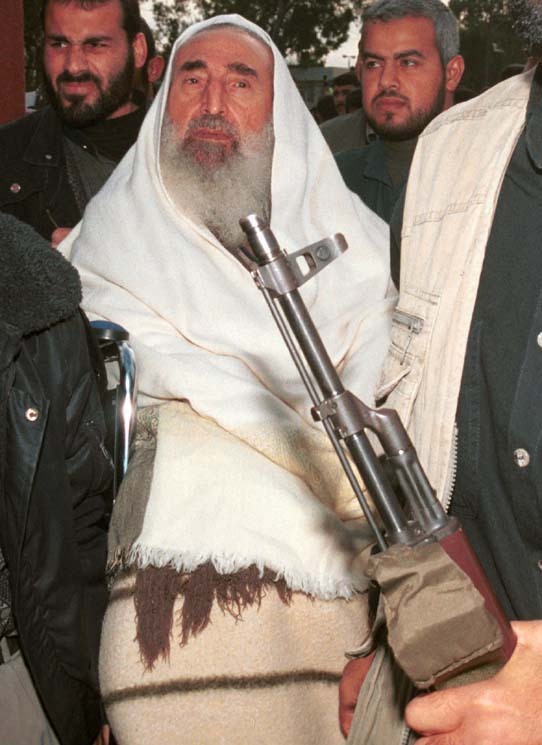 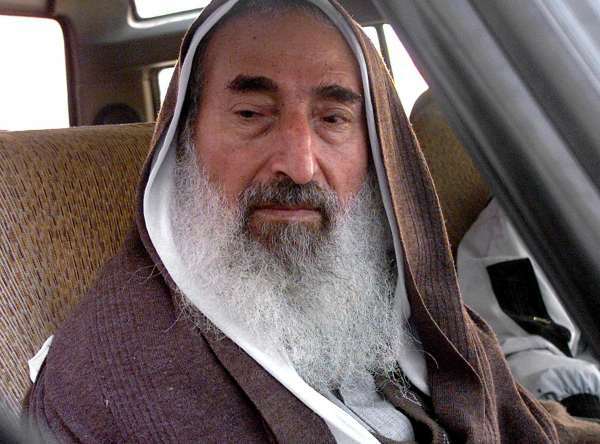 In 1983, Sheikh Yasin was arrested in accusation of possessing weapons and establishing a militant Organization against Israeli Zionist occupation, and exhorting people for Jihad (fighting) against Zionists. 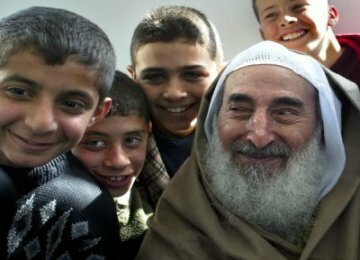 Israeli militant court adjudicated him for 13 years, but in 1985 he was released in the deal of a captive exchange. 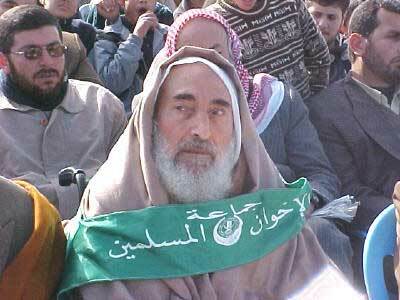 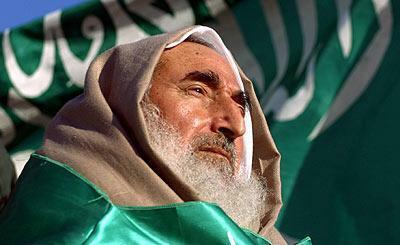 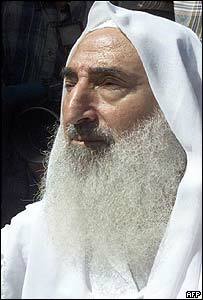 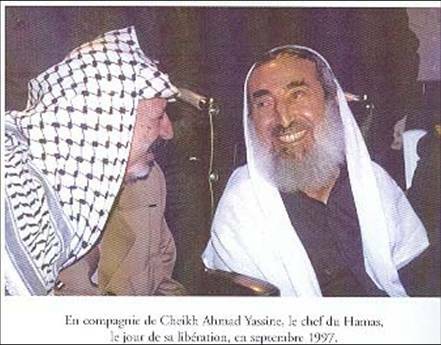 In 1987, Seikh Yasin founded Hamas as the Palestinian wing of the Muslim Brotherhood religious organization. 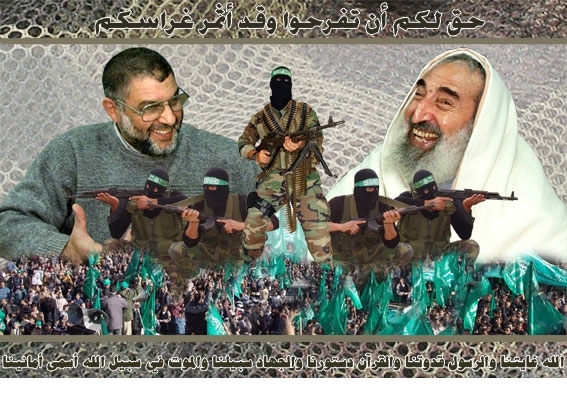 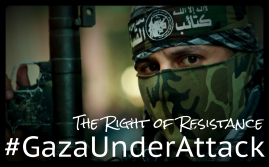 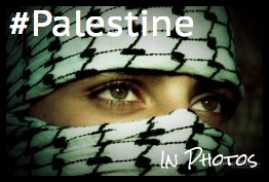 Hamas, meaning “enthusiasm”, “zeal” or “fervor” in Arabic, is an acronym for Harakat al-Muqawama al-Islamiyya, or Islamic Resistance Movement, soon emerges as strongest party in Palestine. 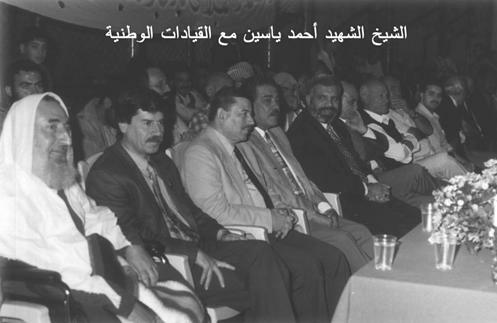 It established three branches: a political wing, a unit for intelligence gathering, and a military wing. 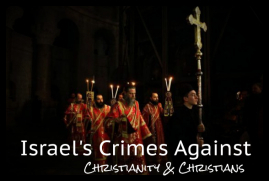 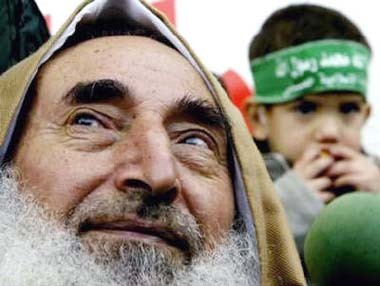 Hamas encouraged Palestinians to reject secularization. 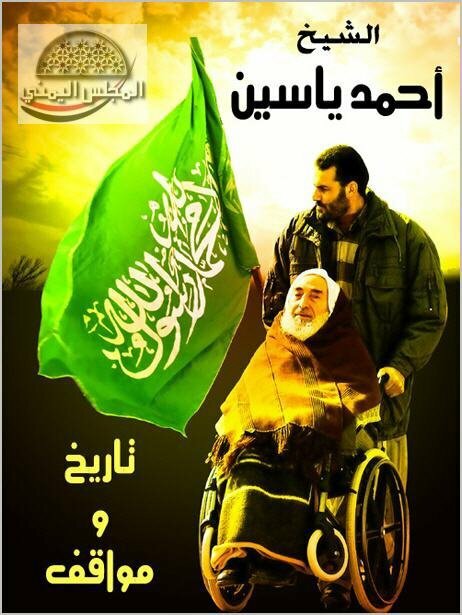 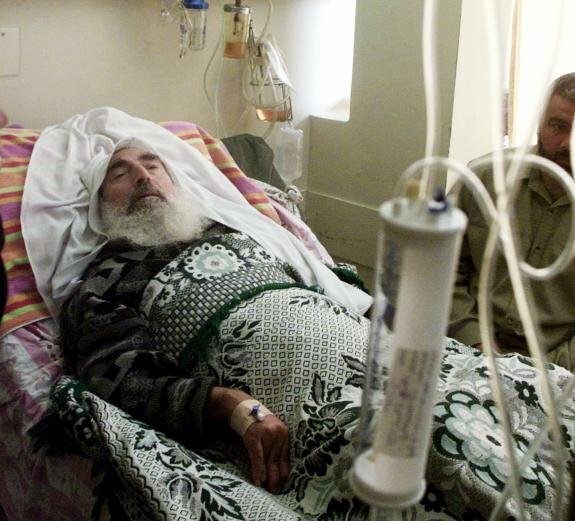 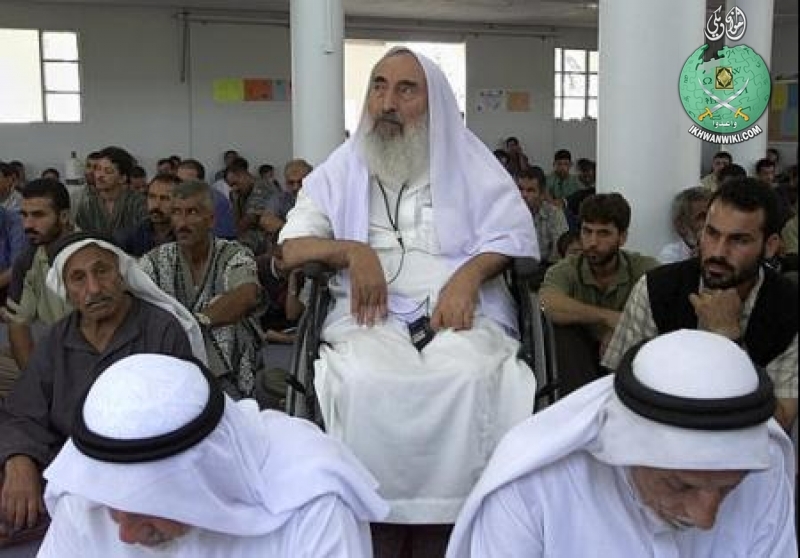 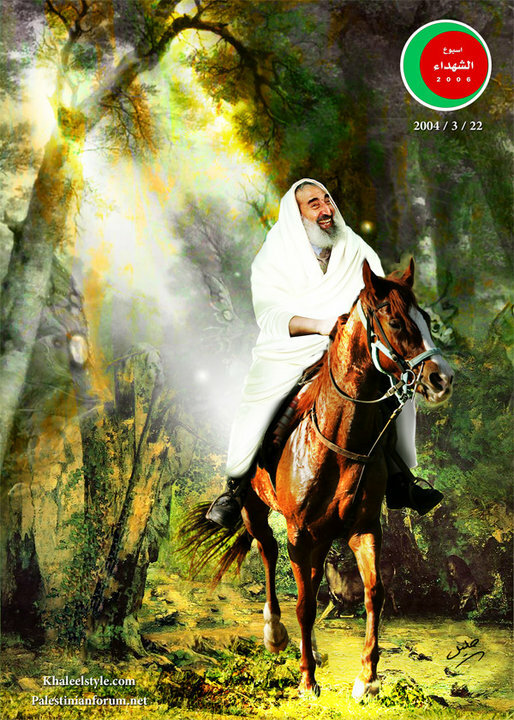 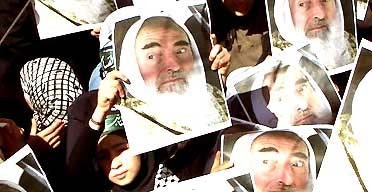 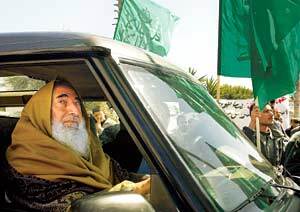 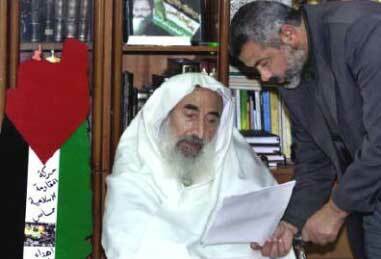 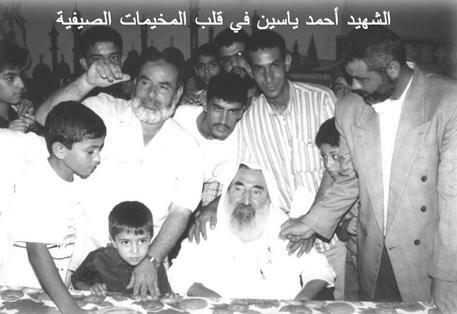 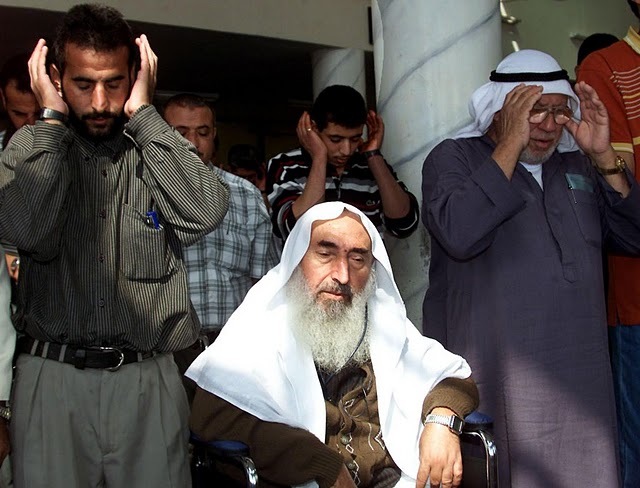 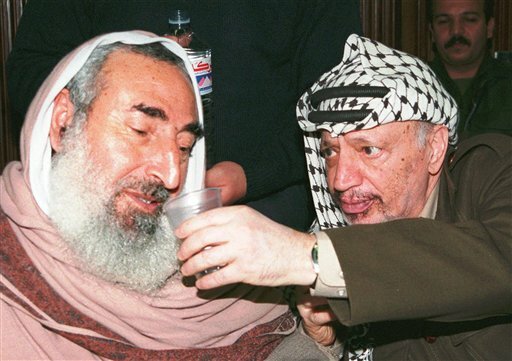 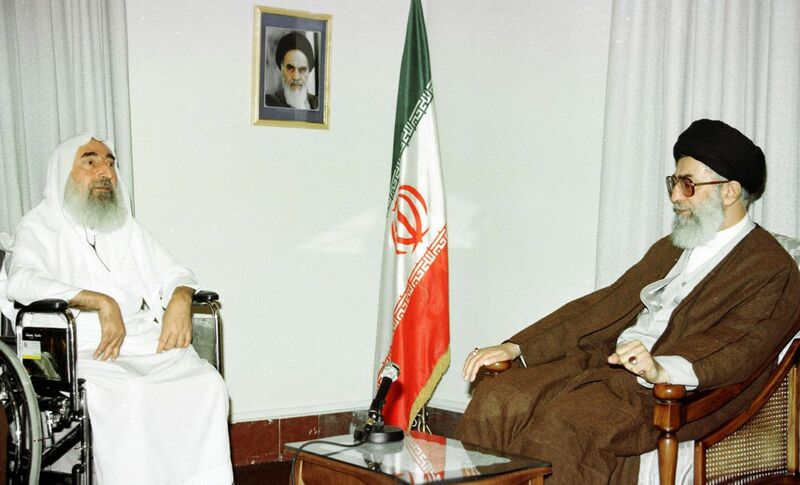 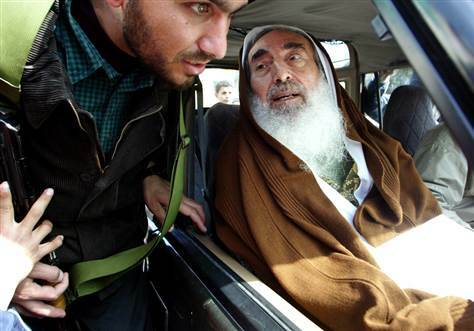 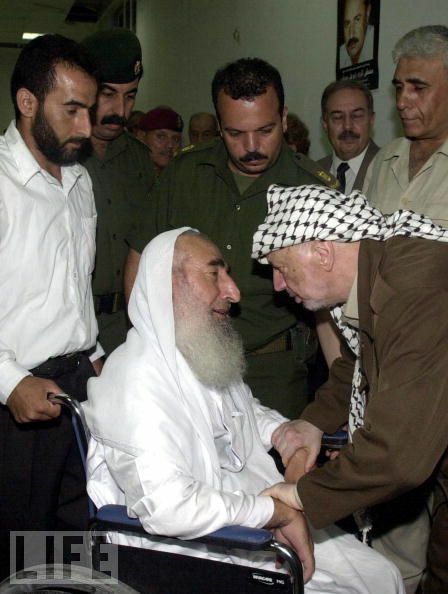 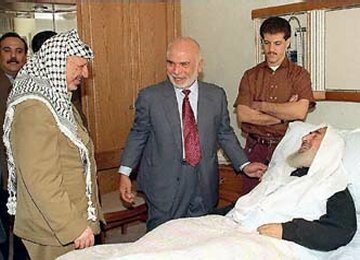 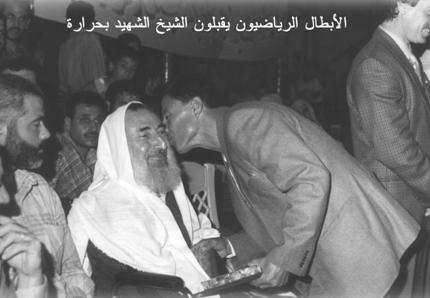 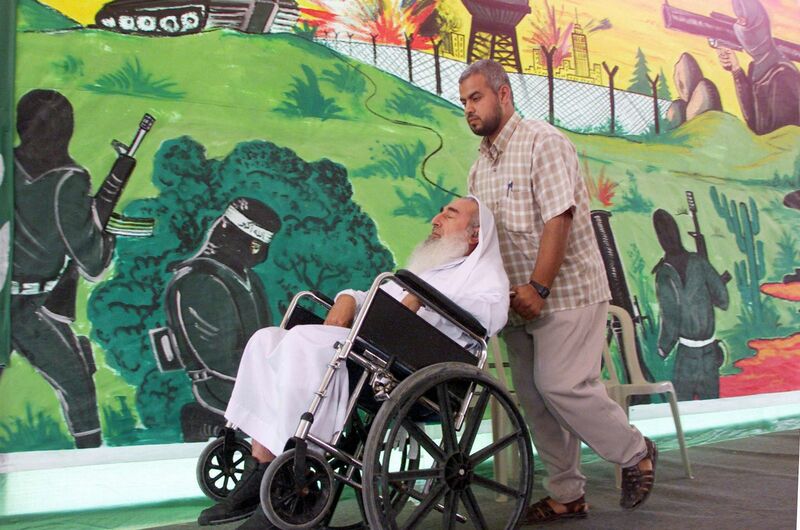 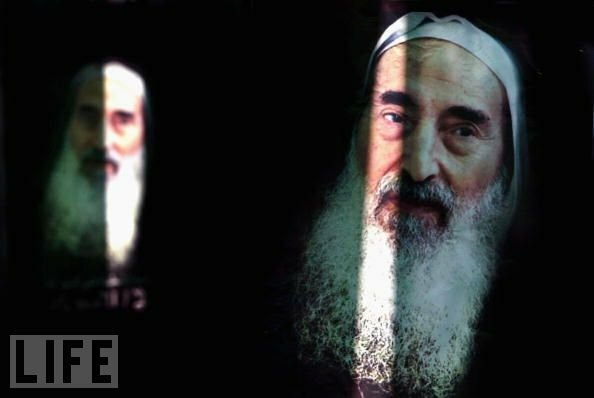 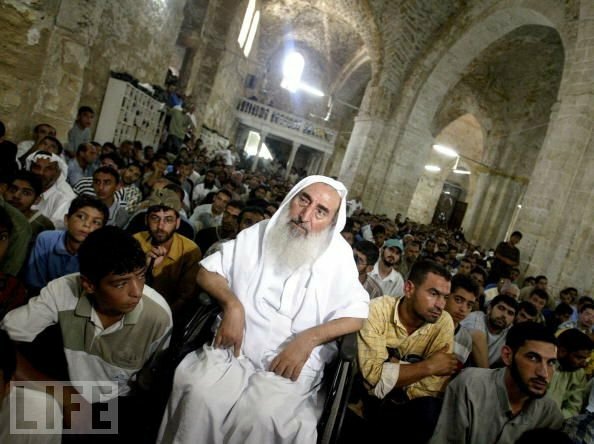 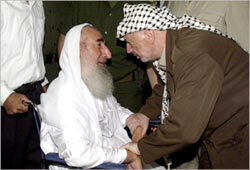 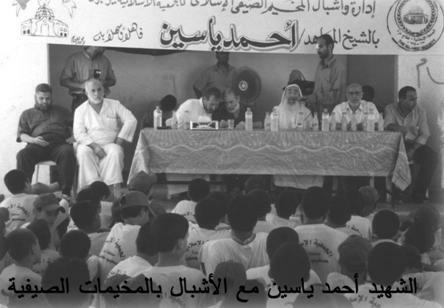 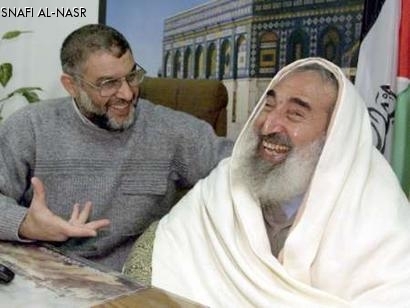 In 1997, Sheikh Yassin was released from Israeli prison as part of an arrangement with Jordan following a failed assassination attempt of Khalid Mashal conducted by the Israeli Mossad in Jordan. 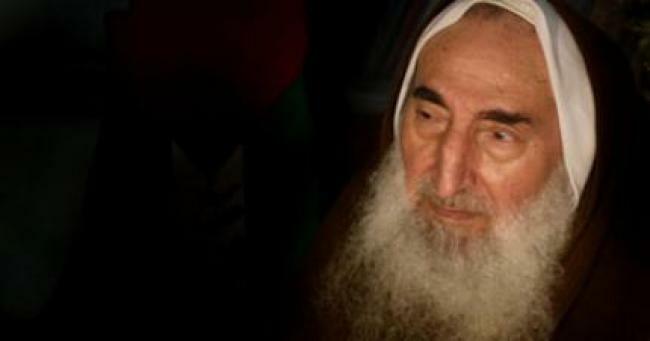 Israel released Yassin in exchange for two Mossad agents who had been arrested by Mashal bodyguards and were handed to the Jordanian authorities. 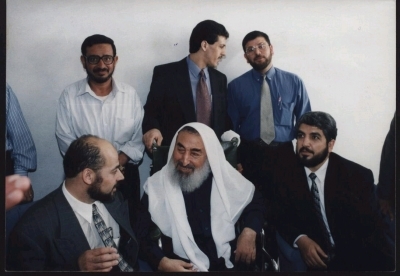 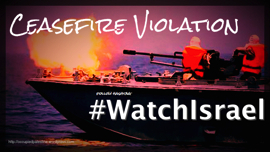 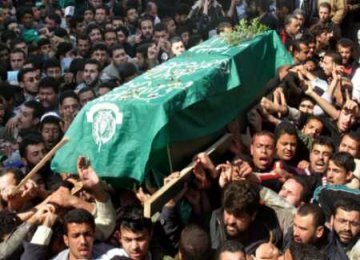 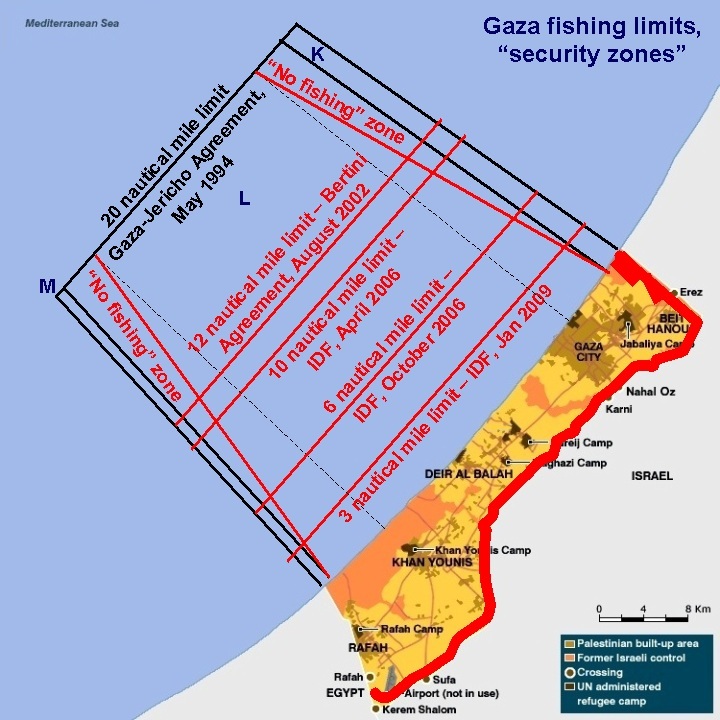 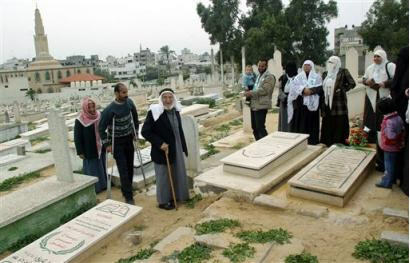 On June 13,2003 Israeli sources announced that the Sheikh as well as all Hamas political Leaders “are not immune” to assassination under the Israeli doctrine of targeted assassination. 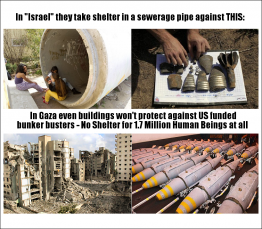 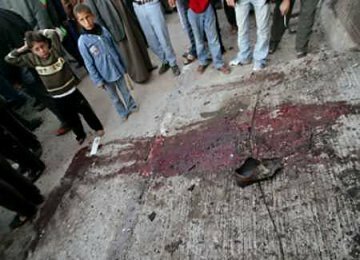 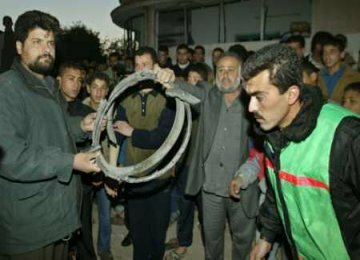 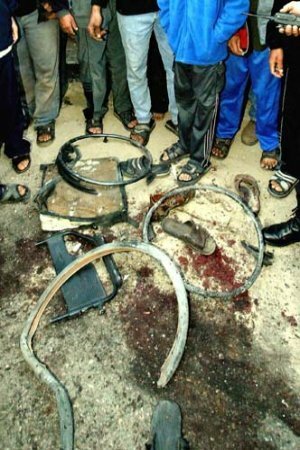 Three months later, on September 6th, 2003, Israeli Air Forces (IAF) F-16 dropped a quarter-ton bomb on a building in Gaza city. 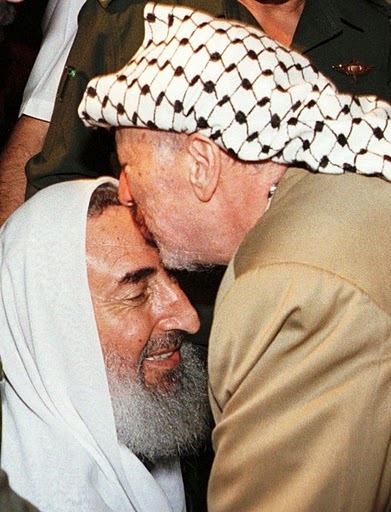 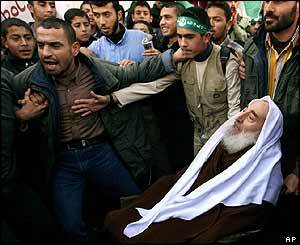 Sheikh Yassin was in the building at the time and was lightly wounded by the assassination attempt. 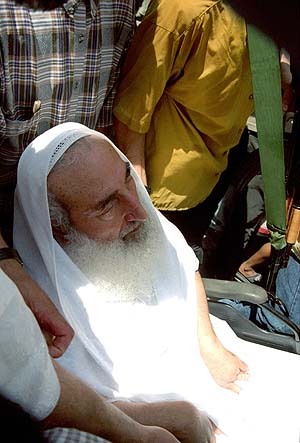 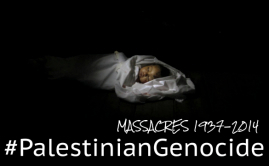 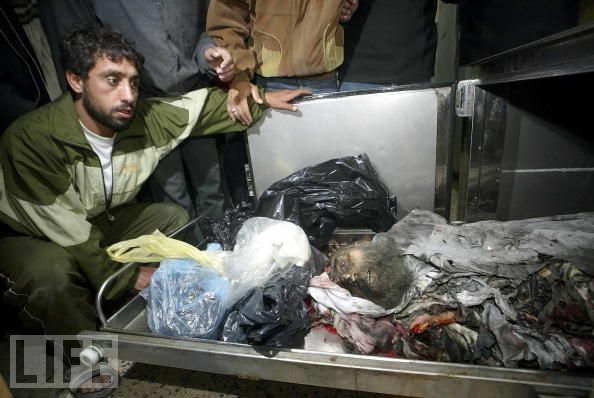 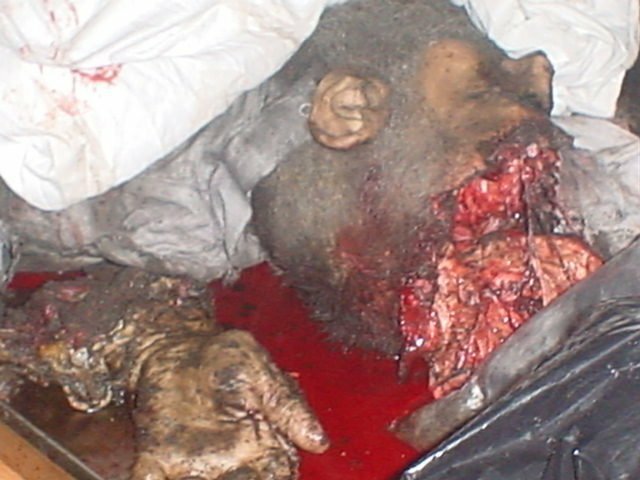 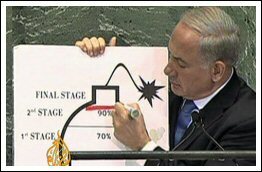 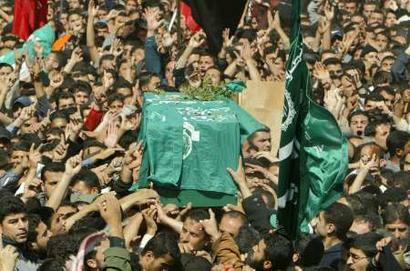 Israeli officials would later confirm that Yassin was a target of the attack. 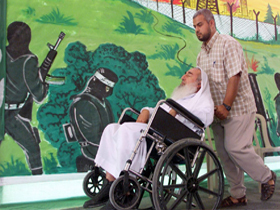 Yassin was treated for injuries sustained in the attack at Shifa hospital in Gaza City. 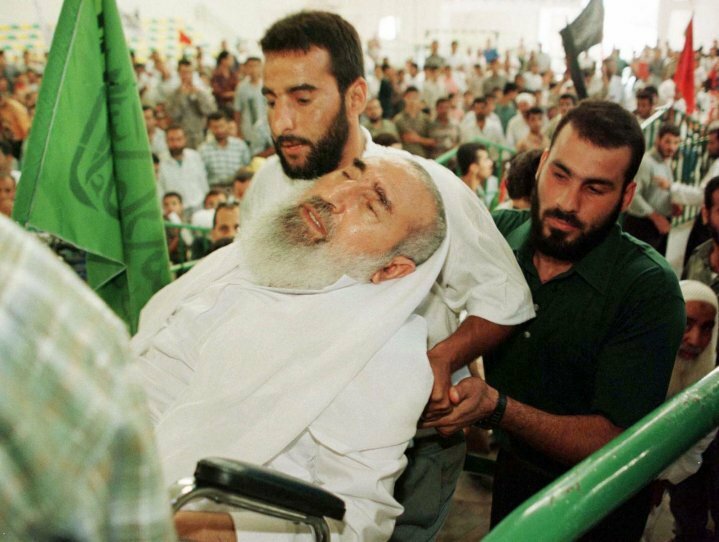 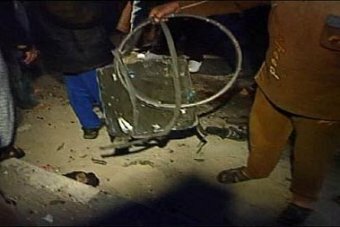 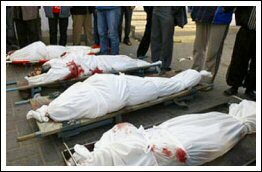 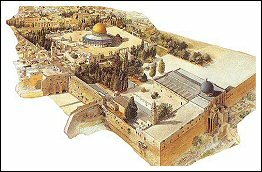 On March 22, 2004, Zionist Helicopters launched three missiles, instantly killing Yassin as he leaves the mosque after morning prayers. 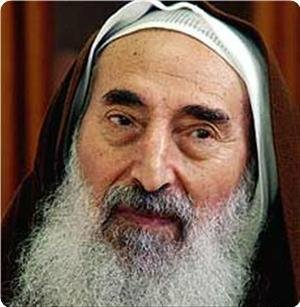 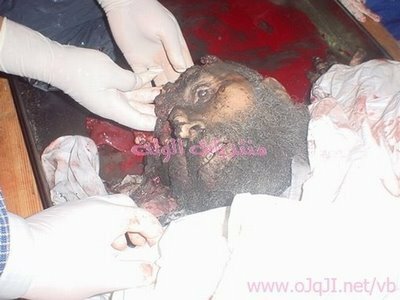 Killing Sheikh Ahmed Yasin as killing Yahya Ayyash, Salah Shehada, Mahmoud Abu Hannoud, Ibrahim Al-Maqadema etc before will not bring peace to the Zionist Israelis but to the contrary more killing of Israelis will be the result of this savage brutal blood lover Sharon and his gangs. 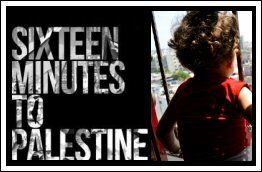 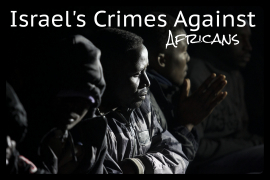 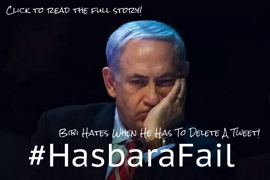 We will wait and see how many Israelis will cry. 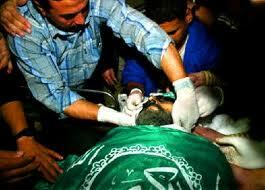 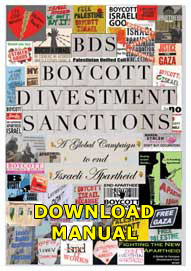 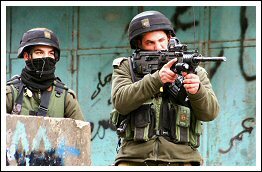 It is true that Sharon and his gangs can kill many of the Palestinians men, women, kids and old men, leaders and fighters but will this solve the real problem of the fact that the Israeli occupation is the root cause of this conflict and there will be no peace for the Jewish Zionists without the elimination of occupation. 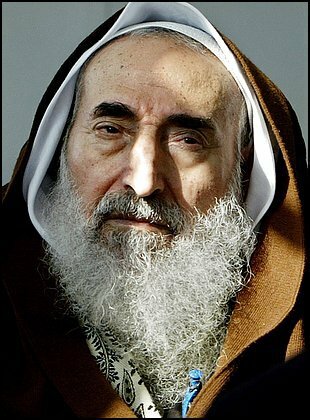 One interesting commentary on the procession of the Sheikh reflect how much people adored this Sheikh—the miracle ” if you saw the women participating, you would say there were no men: if you saw the children, you would say there were no grown ups: if you saw the armed people you would say there were no other people: if you would say the elderly, you would say there were no young people. 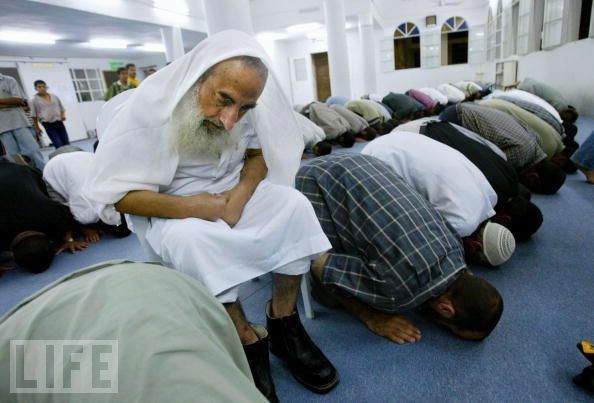 and ease it for their families, loved ones and anyone around them. 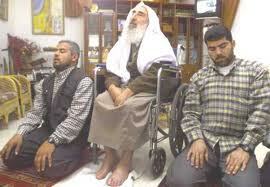 Allahumma Ameen ya Rabbil ‘Alameen.